This chapter will discuss ways in which the iPhone/iPod Touch can be used for language learning. The built-in functions of the iPhone/iPod Touch, along with the various Web Apps and Apps that can be used to enhance these functions, provide a wide variety of ways in which the iPhone/iPod Touch can be used in language learning. Some of these include built-in recording functions, cameras, handwriting recognition capabilities, as well as a huge array of helpful web-based applications and independent applications. Because this chapter could not possibly cover all the options that are available, it will briefly introduce some of these functions and applications and explore how they can be beneficial to language learners. In addition to this, this paper will ways in which applications useful for language learning or teaching can be searched for via Google Apps or the Apps store itself. Traditionally, languages have been taught in a face-to-face setting where the instructor introduces grammatical patterns and vocabulary to students who have access to a textbook, workbook, and lab materials. Things have begun to change as online teaching has become more and more common at the college-level. It is now not uncommon for languages to be taught in either an online or hybrid setting. Even so, beyond the Internet, the tools that are used for language teaching have not progressed too far beyond the additional use of the Internet and computers. 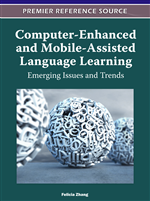 This paper will look at the use of the iPhone and/or iPod Touch as new tools for language teaching. It will explore some of the various options available and how these options can be used in the classroom (face-to-face, hybrid, or online). Two devices that are relatively new to the Mobile Assisted Language Learning scene are the iPhone and iPod Touch. This paper will look at some of the possibilities that these two devices offer language teachers.